Zandronum's welcome IWAD search window-box will appear when an IWAD is not found within the parent directory. When Zandronum is loaded for the first time within the Windows® platform it may ask the user to specify a directory that contains either one of or more than one of the listed IWAD file(s). An IWAD or Internal WAD file is necessary in order to play Doom, Doom 2, ZDoom, GZDoom, Zandronum and any other Doom based engine available. Moreover, the IWAD file contains information such as maps, sounds, music, monsters, items, and other visual and environment aspects of the game. 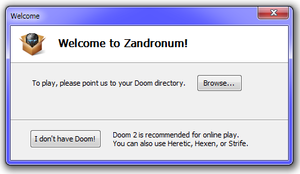 As a result, the IWAD file plays an important role with Zandronum and every other Doom based engine, and running any game without the IWAD file is impossible. Furthermore, if the user has already installed Doom from a floppy disk, or from a CD such as 'Doom for Windows 95' or 'Doom 2 for Windows 95' for example, the IWAD can be used from those installations of Doom or Doom 2. There currently exists two methods of obtaining the Doom or Doom 2 IWAD file. First method is to purchase the game from, for instance, the idSoftware store, Steam, or Amazon. Alternatively, one can download Freedoom which is free and legal. This can be an option for those that are short on money, or just want to test out the Zandronum engine before making such purchases. Freedoom is what the name implies, a free and legal remake of Doom 2 for users to download. However, Freedoom is vastly different from Doom 2 and the maps are not network-compatible with Doom 2. Thus, Freedoom is not a true replacement for the original Doom 2 IWAD, and it should never be considered as such. Nonetheless, using the Freedoom IWAD will still allow the users to connect to almost any server plausible. Duplicate or move all of the files into the Zandronum directory. This method is rather common, but can cause problems if introducing more than one doom port engine or even running the older native engines or can cause more wasted space by duplicating the exact same files within the filesystem. Inside of the config file and already modified IWADSearch.Directories paths. Modify the configuration file. This is rather advanced but this is rather preferred to avoid conflicts and duplications within the filesystem. The initialization file houses all of the users settings within the engine and even can enforce the engine to load files that is specified; and, thus, possible for the engine to automatically detect what IWAD files are available. Open the file with a text editor such as Notepad, Notepad++, VIM, etc. Don't use any word processing software! Hard Link the IWAD to the parent directory that contains the Zandronum executable binary file. Be sure that both the filesystem uses inode addresses (Linux) or MFT entry (Windows), the kernel allows this type of linking, and that the IWAD files are within the exact same medium and not on different filesystems or partition.